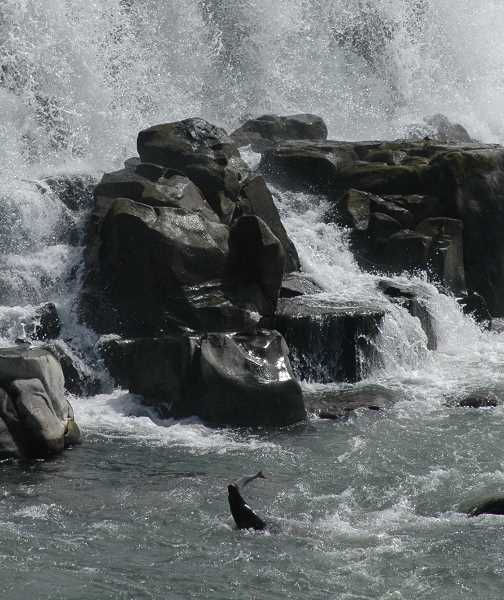 After years of trying other tactics without much success, the Oregon Department of Fish and Wildlife (ODFW) is preparing an application for a sea lion culling permit at the Willamette Falls to protect threatened salmon and steelhead fish. ODFW's work with sea lions at the falls dates back about 10 years, according to spokesperson Rick Swart. "Basically anglers alerted us to sea lions moving in about a decade ago," Swart said. "We tried hazing and monitoring to see what impacts these animals might be having on salmon and steelhead. "They're really smart animals. They would lay off (the fish) while the hazers were out, and as soon as they were gone (the sea lions) would be back." Compared to more minor hazing activities that aim to push sea lions away from an area on their own accord, culling involves the removal of sea lions — often by lethal measure. ODFW must obtain approval from the National Oceanic and Atmospheric Administration (NOAA) before it can begin culling at the Willamette Falls. "Our fish division is preparing a permit application, and it will be submitted to the NOAA hopefully within the next couple of months," Swart said. "We expect a decision sometime in 2018, we hope in time to begin removing sea lions in time for next year's spring season. Realistically, it might not be until fall or later." ODFW has been culling at the Bonneville Dam on the Columbia River since 2008. Between 2008 and 2016, 166 California sea lions were removed from the river. Of those, 15 were placed in permanent captivity, seven died in accidents that were "incidental to trapping" and the remainder were euthanized, according to ODFW. An FAQ on ODFW's website states that it is "too soon to assess" efforts to protect fish on the Columbia River, though there have been positive signs. According to that FAQ, the number of California sea lions feeding at the Bonneville Dam tailrace decreased from a high of 104 in 2003 to 39 in 2012. Swart said there should be no misunderstanding as ODFW prepares its application: This is to protect the fish, not the fishers. "The reason we're making this application is to protect three listed species of fish swimming through the Willamette River and passing through the falls," Swart said. "So as opposed to having a program so guys out there with hog lines don't have salmon pulled off — that's not what it's about. While we're sympathetic, and I'm sure anglers will be appreciative, it's not our purpose to make their catch bigger. Our purpose is to protect three listed species of migratory fish." Downriver in Lake Oswego, observers likely won't notice a difference. Park Ranger Ben LaBounty says sea lions are often sighted in the river near the city, but rarely venture ashore. According to Swart, the culling program at Willamette Falls would be similar to what is done at Bonneville Dam. "Basically it's a 'three strikes and you're out' kind of program," he said. 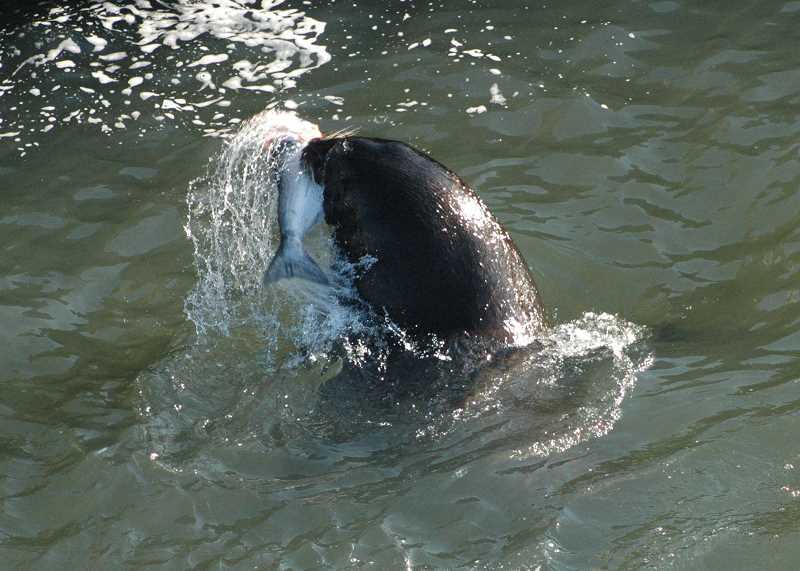 "How it works is, if observers see a sea lion eating salmon, they try to record that. If they see it again, they try to put a brand on it. So that's two strikes, and we have traps at the Bonneville Dam, so if a branded sea lion gets on a trap then it's (removed)." The two species of sea lions generally found on the river — California and Steller sea lions — are also listed for protection under the Marine Mammal Protection Act, according to Swart. "That's part of the rub, it's one listed species preying on another listed species," Swart said. "It makes it difficult. You want to protect both of them, really."